It is less usual for a runner’s son/daughter to take up the sport than one might expect. Athletes like Glen Stewart or Susan Partridge are not very common in the sport. Archie Craig is probably unique in that both of his sons became runners, better still international runners albeit for a different club. Older son Archie junior was mainly pre-war and younger son George had a career that lasted until 1951. It is with Archie junior that we are concerned here. All three raced sparingly and none of them competed much during the summer at all, and they were not ever-presents in the short relays at the start of the winter either.. Unlike his Dad, who was a member of Bellahouston Harriers, young Archie ran for Shettleston Harriers – the two clubs are based quite close to each other and there have been talks at various times of mergers, but the rivalry was intense. Archie, senior had a wonderful career winning medals both individual and team, as well as running for Scotland, with his last international cross-country event in 1924. As for the boys, the younger son, George, won the Scottish Youths championship in season 1934/35 as Archie, Junior, ran in the senior race. That season he ran in the Midland District championships where he was 63rd and in a Shettleston team that finished sixth. In the National later that season he was 59th and the team was fourth. It is with Archie that we are concerned here. Archie was 77th in the Midland District championship at Hamilton in 1934 for the team that finished sixth but there was no mention of him in other races that winter or the following summer. The first mention of Archie in 1935 is in January when he ran in the club team in the eight man relay between Edinburgh and Glasgow in January 1935. Here he ran the fifth leg, maintaining the leading position that he had been given: unfortunately the following runners could not hold on to it and the team was fifth at the finish. In the national that year, he was 59th and fifth counter for the team that was fourth. Craig led the team home but it could do no better than finish fifth in a race surprisingly won by Shawfield Harriers. The team did better in the National, finishing equal fourth with Plebeian Harriers, but they did it without Craig. The Edinburgh to Glasgow was held on 4th April in 1936 and the Craig-less team was second. That summer, despite being in good condition, and despite his club having teams in various two and three miles team races on the track (Firhill, Hampden, Ibrox, etc) there was no sign of Craig. His father and brother were said to ‘race sparingly’ and it may have been a family thing but for such a good country runner he seems to have been posted missing during the summer months. It was then on to the winter 1936/37 season. “On July 10th a squad of Shettleston runners did not have far to travel when they took part in the fledgling Carntyne AC’s first track and field venture at Greenfield Park in Shettleston. The two mile team race trio of Jim Ross (6), Archie Craig (8) and Alec Hill (10) could manage only third place, suggesting that the competition was formidable. …. The West of Scotland championships in Dunoon stuck with yards, feet and inches and brought the Craig brothers together in the final of the 1,365 yard race (the mile) in which Archie was first and George second. ” The Two Mile Team Race at Carntyne was won by Edinburgh Northern with with 8 points, Plebeian Harriers were second with 13 points against Shettleston’s 24 and as far as the District Championships were concerned, the mile is usually 1760 yards so it was a bit short but the result would probably have been the same. In winter 1937/38 the Shettleston club 5 miles championship was held on 23rd October, 1937, the first championship was the District Relays in October where there were two Shettleston Harriers teams in action but Craig appeared in none of these. Nor was he in evidence at the District Championships at Hamilton where Bellahouston emerged victorious. He did turn out, however, in the biggest race of the year: the National on 5th March 1938 at Ayr, Craig finished seventh – second team member to finish after Flockhart (fifth) and two places ahead of Ross but despite that, the team had to take second to Maryhill whose Emmet Farrell was champion. Archie Craig was selected for the international championship. In that race at the Balmoral Showground in Belfast, Craig was second Scot to finish (24th individual) with Flockhart eighth and the team fifth. 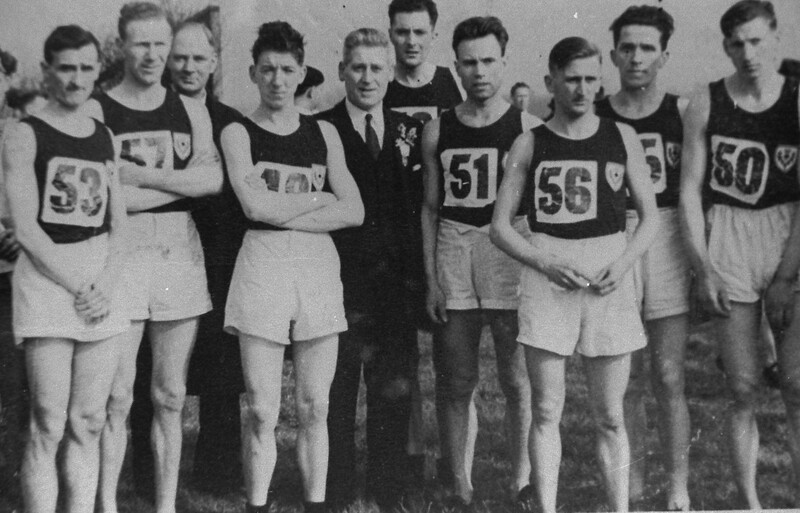 Season 1938/39 and the first winter championship was the Midland District relay with Bellahouston Harriers and Shettleston Harriers joint favourites for the title. The Shettleston quartet was led off by Craig on the first stage who finished second, two seconds behind Maryhill Harriers man, W Nelson, in 13:22 with Bellahouston’s GM Hunter well back on 14:01. W Sutherland went into the lead on the second stage but on the last lap, Emmet Farrell of Maryhill pulled in 80 yards and won the race for his team. Craig was fifth fastest on the day, only 19 seconds slower than Farrell in first. Well out of the medals in the District championship with a very weak team (minus Craig, Flockhart and Sutherland) they headed into the National. The championship was held on 4th March at Lanark Racecourse and was won by the outstanding athleteof the year, R Reid of Doon Harriers. Craig was fourth overall but third in the team championship and Shettleston was third team to finish. He was of course automatically selected for the international. It was the last national championship before the war and Craig had acquitted himself well but unfortunately in the international he failed to finish. Four weeks after the international, Craig was part of the Shettleston Harriers team that finished third in the Edinburgh to Glasgow Relay Race. He ran on the tough second stage and pulled the club up an amazing seven places – from twelfth to fifth – with the third fastest time of the day. He was followed by teenage brother George on the third stage who went from fifth to third with second fastest time of the afternoon. Between them, the brothers had taken the club up nine places. On Tuesday June 6th, with war imminent, there was a strong Shetleston Harriers contingent at the St Vincent de Paul sports meeting at Maxwell Park in Baillieston. We are told that Archie Craig competed but f it was in the ThreeMiles team race, he was fourth club man – no disgrace when the first three were W Sutherland, JC Ross and J Flockhart. That was to be one of the last meetings before the war started and Archie Craig served as a dispatch rider in the RAF. There were no championships during the war and the sport was run on a ‘maintenance’ basis by the Scottish Cross Country Association with unofficial championships being held wherever possible. 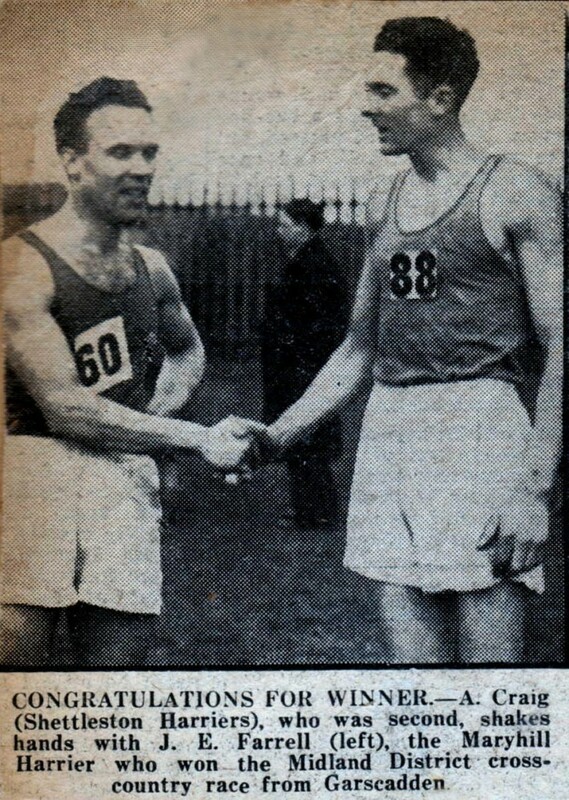 There was, for instance, a Midland District event held in March 1940 in which Archie Craig finished second to Emmet Farrell of Maryhill Harriers – see the photograph below which is reproduced courtesy of Alex Wilson. But Archie Craig’s competitive career was effectively over – he ran in none of the post-war championships, the family banner being carried by brother George while father Archie forged a notable career as an administrator.